With the increasing need to take an holistic view of landslide hazard and risk, this book overviews the concept of risk research and addresses the sociological and psychological issues resulting from landslides. Its integrated approach offers understanding and ability for concerned organisations, landowners, land managers, insurance companies and researchers to develop risk management solutions. Global case studies illustrate a variety of integrated approaches, and a concluding section provides specifications and contexts for the next generation of process models. 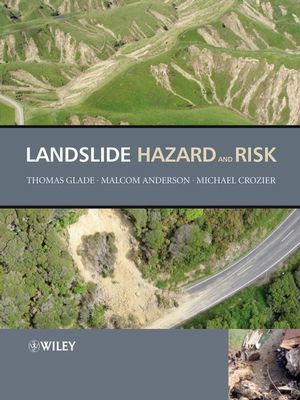 Thomas Glade is the editor of Landslide Hazard and Risk, published by Wiley. Malcolm G. Anderson is the editor of Landslide Hazard and Risk, published by Wiley. Michael J. Crozier is the editor of Landslide Hazard and Risk, published by Wiley. 1. Landslide Hazard and Risk: Issues, Concepts, and Approach(M. J. Crozier and T. Glade). Part I: Conceptual Models in Approaching LandslideRisk. 2. The nature of landslide hazard impact (T. Glade & M.Crozier). 3. A review of scale dependency in landslide hazard and risk(T. Glade & M. Crozier). 4. Systematic procedures of landslide-hazard mapping for riskassessment using spatial prediction models (Chang-Jo F. Chung& Andrea G. Fabbri). 5.Vulnerability to landslides (David Alexander). Part II: Evaluation of Risk. 6. Landslide risk perception, knowledge, and associated riskmanagement: Case studies and general lessons from Glacier NationalPark, Montana, USA (David R. Butler & Lisa M.DeChano). 7. Cultural consideration in landslide risk perception (GarthHarmsworth & Bill Raynor). 8 Reply of insurance industry to landslide risk (Hans-LeoPaus). 9. The role of administrative bodies in landslide riskassessment (Kurt Hollenstein). 10. Addressing landslide hazards: Towards a knowledge managementperspective (S. Michaels). Part III: Management of Landslide Risk. 11. Management frameworks for landslide hazard and risk: issuesand options (M. J. Crozier). 12. Reducing landslide hazards and risk in the United States:The role of the U. S. Geological Survey (G. F. Wieczorek, P. L.Gori & L. M. Highland). 13. Basic data and decision support for landslide management: Aconceptual framework (Walter Pfluegner). 14. Instability management from policy to practice (R.McInnes). 15. Geomorphologic mapping to assess landslide risk: concepts,methods and applications in the Umbria Region of central Italy(Paola Reichenbach, Mirco Galli, Mauro Cardinali, FaustoGuzzetti & Francesca Ardizzone). 16. Remote sensing of landslides (Vern Singhroy). 17. The rise and fall of a debris-flow warning system for theSan Francisco Bay Region, California (Raymond C.Wilson). 18. Reforestation schemes to manage regional landslide risk(Chris Phillips & Michael Marden). 19. Geotechnical structures for landslide risk reduction(Edward Nicholas Bromhead). Part IV: 'End-to-End Solutions' for LandslideRisk Assessment. 20. Towards the development of a landslide risk assessment forrural roads in Nepal (D. Petley, G. J. Hearn & A.Hart). 21. Quantitative landslide risk assessment of Cairns, Australia(Marion Michael-Leiba, Fred Baynes, Greg Scott & KenGranger). 22. The story of quantified risk and its place in slope safetypolicy in Hong Kong (A. W. Malone). 23. Rockfall risk management in high density urban areas. TheAndorran experience (Ramon Copons, Joan Manuel Vilaplana, JordiCorominas, Joan Altimir & Jordi Amigó). 24. Landslide risk assessment in Italy (MarinoSorriso-Valvo). 25. An initial approach to identifying slope stability controlsin southern Java and to providing community-based landslide warninginformation (D. Karnawati, I. Ibriam, M. G. Anderson, E. A.Holcombe, G. T. Mummery, J-P. Renaud & Y. Wang). 26. Landslide hazard and risk - concluding comment andperspectives (T. Glade & M. Crozier).